Brands are constantly on the lookout for new ways to incorporate social media into their websites and campaigns and social networks are happy to comply. Reddit, the self-described front page of the Internet, has recently announced the launch of embeddable comment threads. The announcement comes after months of beta testing by the social network and its beta testers. 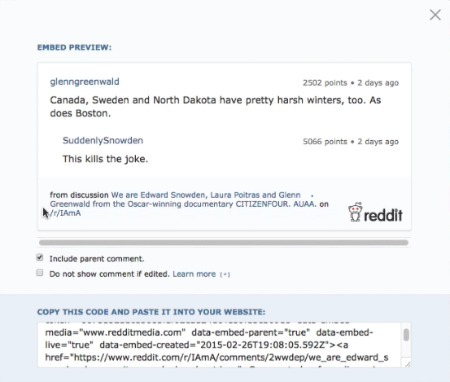 Through reddit’s embeddable comments users can embed a comment along with the comment that inspired it (aka the parent comment) on their website instead of having to take screenshot or copy and paste a wall of text. Comments which are embedded on other websites will always contain a link back to the original comment and subreddit as well as respect edits and deletions that the comments author made. To embed a comment user’s must select the “permalink” link under the comment and then select “embed” to generate a small snippet of code. It is at this point which users have the option to include the parent comment or exclude it.